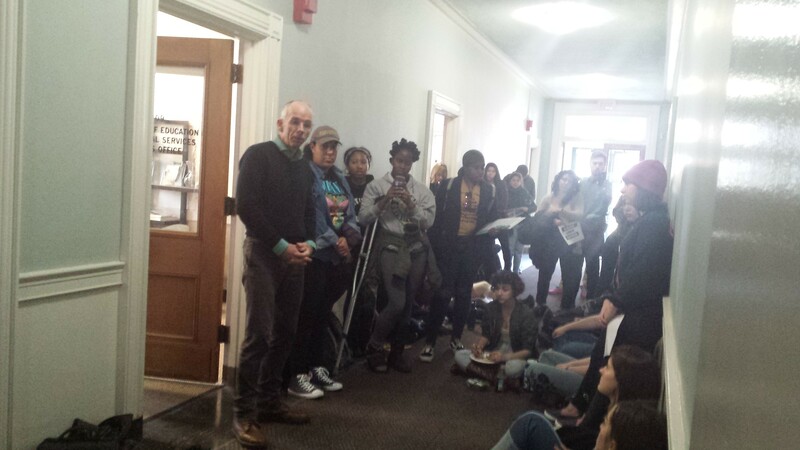 A group of University of Vermont student protesters spent much of Monday occupying the Waterman Building, where leaders met with school deans and even university president Tom Sullivan to discuss the group's demands related to racial justice on campus. Students started streaming into the Waterman Building shortly before noon, quickly filling up the lobby as well as the stairways and balconies. A line of people also started to form outside the building. Organizers estimated that the crowd at its height contained nearly 400 people. Those in the building, lead by the NoNames for Justice group, chanted familiar slogans calling for the resignations of Sullivan, provost David Rosowsky and vice provost Annie Stevens. Another contingent waited outside the office of Thomas Scott, dean of the College of Education and Social Services, as he met with group leaders. The sides emerged shortly after 1 p.m. Scott explained to the crowd that he wouldn't join William Falls, dean of the College of Arts and Social Sciences, in signing the list of demands. "I can't mandate faculty to attend diversity training," said Scott. He said he'd continue to have talks with members of the student group. "This group has my support," he said. Sophomore Nyria Stuart-Thompson, a member of the university's Womyn of Color Coalition, was one of those who met with Scott. "I really wished he would just sign it," said Stuart-Thompson. "If the dean of the biggest college said yes, I feel like we should all follow." Nancy Matthews, dean of the Rubenstein School of Environment and Natural Resources, was the other dean who did sign the list. Earlier Monday, Sullivan sent a memo to the campus community in which he outlined the steps the university would take to "expand [its] longstanding commitment to building a diverse, equitable and inclusive" community. Among his pledges: to provide and require professional development to all faculty who teach diversity-related courses, and to provide funding to recruit, hire and retain diverse faculty and staff. "Every school and college is fully on board with these additional steps," Sullivan wrote in a statement. "We are re-energizing our continuing commitment to these issues, putting these initiatives in concrete terms, and requiring systematic implementation throughout the university." But those vows did not appear to appease the students. A smaller but still sizable crowd remained by early afternoon Monday and began putting up posters in support of the Black Lives Matter movement inside — and outside — of Waterman. "This is Oakland," read one sign attached to columns in the front of the building, paying homage to the California city where the Black Panther Party was founded. "Our house!" More students began streaming into the building again by 4:30 p.m. as NoNames for Justice leaders prepared to meet with Sullivan at 5 p.m. Those assembled chanted support for the student leaders during the negotiations. For the next two hours or so, well-wishers sent the students pizza, snacks, fruit, soda and water. An employee from Leonardo's Pizza said the Peace & Justice Center had paid for $200 worth of pizza. Shortly before 7 p.m., the students left a first-floor lounge, where a previously scheduled talk on the Holocaust by a guest lecturer from the University of Nebraska-Lincoln was to take place. That event was eventually moved to a different location. The students, meanwhile, relocated to classrooms where they did homework, talked or watched movies as they waited word on the negotiations. By 9 p.m., campus police told students that they'd be arrested for trespassing if they didn't leave Waterman within the hour. About twenty minutes later, NoNames for Justice leaders emerged to address the remaining crowd of about 100 students, telling them to take down the banners and posters before leaving. Harmony Edosomwan announced that the student leaders would have another meeting with the administration on Wednesday. She declined to give more specifics because negotiations are ongoing. "A lot of things that I wanted them to do tonight, they didn't do," including using a mediator to oversee the discussion, Edosomwan said. "I feel really supported by our faculty of color and people of color around us, and a lot of our white allies," said organizer Angelica Crespo. "But in terms of administration, it's still really difficult to try and get through [to them] and try to pass on these [demands]." Around 10 p.m., university vice president for executive operations Gary Derr sent out an email describing the negotiations as "good, constructive discussions." But he described some of the protests as a "significant disruption" to campus. "We are prepared to take all appropriate disciplinary and legal steps to address the situation should it continue," Derr wrote in his statement. 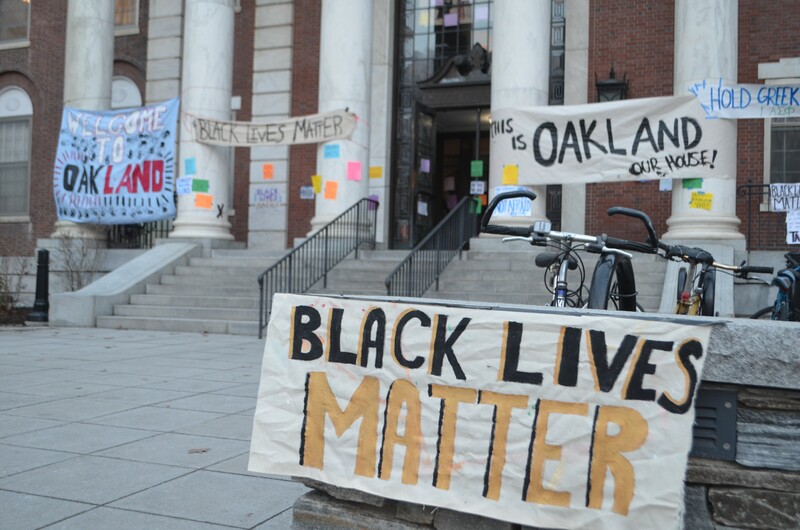 Monday's protest was the latest in what's become several days of on-campus agitating. UVM staffer John Mejia started a hunger strike February 16 to protest racial inequality on campus and to demand the university address the issues. 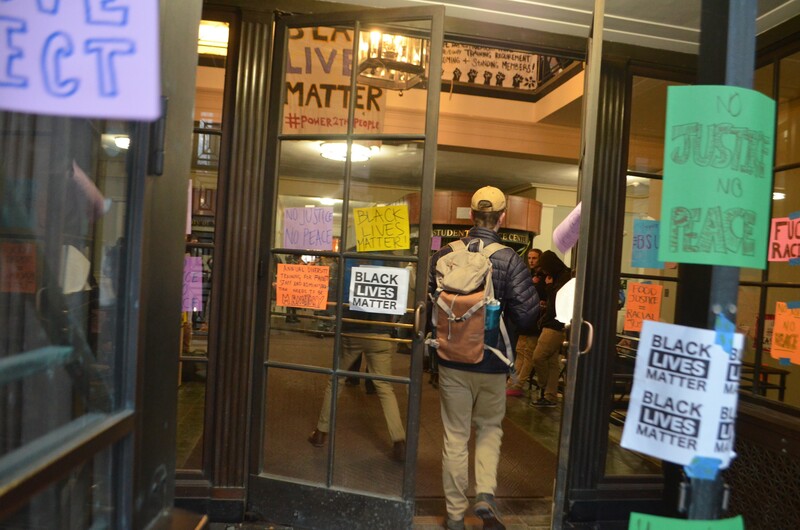 On February 20, students and Mejia occupied the Waterman Building in protest. Two days later, protesters blocked traffic at Main and South Prospect streets for three hours, calling on Sullivan to meet with them. Last Friday, Mejia — who uses the pronouns "they" and "them" — announced the end of their hunger strike as students assembled inside the Davis Center.